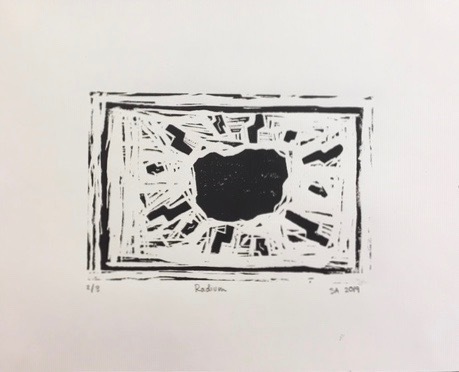 Ms. Stephens’ eighth grade art classes completed a project using linocut prints, which is currently exhibited in the front hallway. Students designed a symbol that represented an idea, story, or feeling in their life. They then transferred the symbols to a linoleum block to carve. The white areas in the print were carved away on their block, while the black areas remained raised. The goal was to have a balance of both positive and negative spaces to create a visually dynamic and even image.